I have said elsewhere that between the Kasich “deal” and picking Fiorina as his VP, Ted Cruz has done the two things in a week that will guarantee a Trump nomination. Well, it looks like Ted reached conclusions similar to mine. I’m not surprised that he withdrew, per se. I did expect – as I noted long ago – that it would be closer to the convention if it happened. I’m taking it to mean that Cruz is confident that Trump has a clear path and that there is no chance of the RNC from dropping in a patsy of their own. Remember, Cruz – as only suspended – still retains he delegates and has that sword to hold over the establishment’s necks. As far a VP? I’m seeing the self-proclaimed “experts” talking about who Trump needs for a running mate. They all seem to be part of the political class that he and Cruz ran against. The truth is, though, Trump doesn’t need any of these recommendations. He already has the votes for the states where these suggestions mean anything. What Trump needs is someone who can deliver Senate votes when it matters or someone who can get him the states where he was a bit weaker. 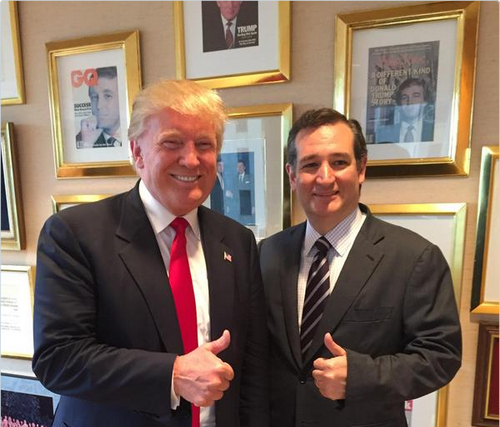 I still think Trump/Cruz is a magic ticket as far as the election is concerned. And I have no concern that they couldn’t have a nice “kiss and make up” event. However, there is that little deal of the VP being Senate President. If that’s a deciding factor, then I’d have to consider Jeff Sessions for the VP unless McConnell can be removed as Majority leader and replaced by Sessions. I think the VP pick may be a bit more important than usual because the office may be more active in the Senate that current tradition. Perhaps not as active as Adams 200 years ago, but certainly more than at present. This would also be a good reason for Sessions to be VP. Remember that he was the one behind the “Nuclear Option” for court appointments that Republicans considered at one time. Now that the Democrats have set the precedent, it will probably take that to get Cruz, or any Constitutionalist, onto SCOTUS. Democrats will be playing for keeps on this one. They rely on the courts for their agenda since it will be a few more generations of controlling the education system before they can hope for people to surrender their liberty willingly. Of course, this all depends on what Trump’s motivations are. If he is the evil double agent that Glenn Beck & Co. claim, then this is all moot. If Trump is the old school Reagan supporter that he claimed in the past or simply motivated by greed and ego enlightened self interest, it would be in the interest of both to establish that Constitutionalist court. Anyone who sets a 6-3 or 7-2 court is going to have a permanent place in history and will be the one credited for ending either Progressive or Conservative political influence in the US for generations. This entry was posted in Current News, Politics and tagged Constitution, Cruz, Culture war, Current Events, Democrats, election, Election 2016, government, illegal immigrants, political correctness, politics, Progressives, Republicans, RNC, TEA party, Trump. Bookmark the permalink.